Director – Cy Endfield, Screenplay – John Prebble, Daniel Ullman & Crane Wilbur, Based on the Novel by Jules Verne, Producer – Charles Schneer, Photography – Wilkie Cooper, Underwater Photography – Egil Woxholt, Music – Bernard Herrmann, Visual Effects – Ray Harryhausen, Art Direction – Bill Andrews. Production Company – Ameran Films/Columbia. It is 1865 at the height of the American Civil War. A group of captured Union soldiers make an escape in a hot-air balloon. However, the balloon is caught in a storm and they are washed up on a desert island. There they build shelter for themselves and are later joined by two shipwrecked Englishwomen. They must also fight off a number of everyday birds and animals that have been expanded to giant-size. They receive aid from a mysterious benefactor who leaves them provisions. This turns out to be Captain Nemo who has found a means of creating giant-size animals as a way of solving world hunger with the intention of eliminating the causes of war. Mysterious Island (1875) was Jules Verne’s sequel to Twenty Thousand Leagues Under the Sea (1870). The story is principally a desert island adventure and Captain Nemo and his submarine turn up in later chapters. On screen, Mysterious Island has the peculiar distinction of having been filmed more times than Twenty Thousand Leagues Under the Sea. It has notched up nine-and-a-half adaptations – parts of the silent Twenty Thousand Leagues Under the Sea (1916); the silent The Mysterious Island (1929); an obscure Russian-made adaptation Mysterious Island (1941); the serial Mysterious Island (1951); this; the obscure Spanish/French/Italian The Mysterious Island of Captain Nemo (1972) with Omar Shariff as Nemo; Juan Piquer Simon’s Monster Island/Mystery of Monster Island (1981); the 22 episode tv series Mysterious Island (1995) with John Bach as Nemo; the Hallmark tv mini-series Mysterious Island (2005); the low-budget The Mysterious Island (2012); and the family oriented Journey 2: The Mysterious Island (2012) – against Twenty Thousand Leagues‘s five adaptations – the silent Twenty Thousand Leagues Under the Sea (1916); Disney’s 20,000 Leagues Under the Sea (1954); the tv movie 20,000 Leagues Under the Sea (1997) with Ben Cross as Captain Nemo; the tv mini-series 20,000 Leagues Under the Sea (1997) with Michael Caine as Captain Nemo; and The Asylum’s 30,000 Leagues Under the Sea (2007) with Sean Lawlor as Nemo. The reason for the greater number of films versions of Mysterious Island becomes clear when one remembers just how definitive an adaptation of the story the 1954 Disney version of Twenty Thousand Leagues Under the Sea was. It is hard for any subsequent adaptation to stand up against the Disney version, whereas Mysterious Island lacks any defining classic version so far. The novel of Mysterious Island is a straightforward story of desert island survival with no science-fiction content (other than Nemo’s submarine). 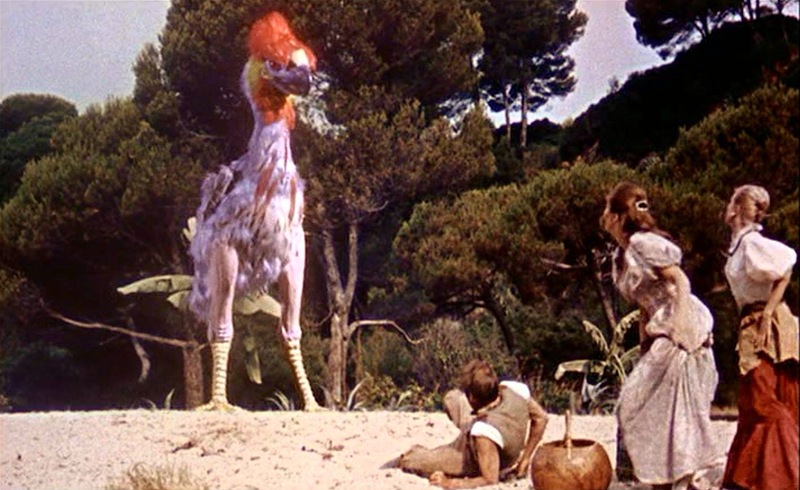 It is interesting to see what various film adaptations of Mysterious Island have managed to tack onto the Verne story, having thrown in everything from merpeople (the 1929 version), invading aliens from the planet Mercury (the 1951 version); time travel and mutant creatures – the low-budget 2012 version; and giant animals – here and in the 1981 and 2005 versions (which in Monster Island turn out to be monsters placed on the island by a bored boy’s father to teach him life lessons!!!). It should be noted that the most straightforward and faithful adaptations of the story – the 1941 and 1972 versions – also happen to be regarded as the dullest. This version seems mounted very much in the shadow of and undeniably reliant upon the Disney 20,000 Leagues Under the Sea – the plush Victorian designs for the interior of the Nautilus have been taken almost direct from the Disney version. The film conducts a straight-forward adaptation of the basic plot of the book – the Confederate prisoners escaping by balloon, the mysteriously beneficial Nemo – although about halfway through the survival story no longer seems enough and the film sees fit to add monsters and somewhat improbably romantic interest by having two Englishwomen also washed up on the island. 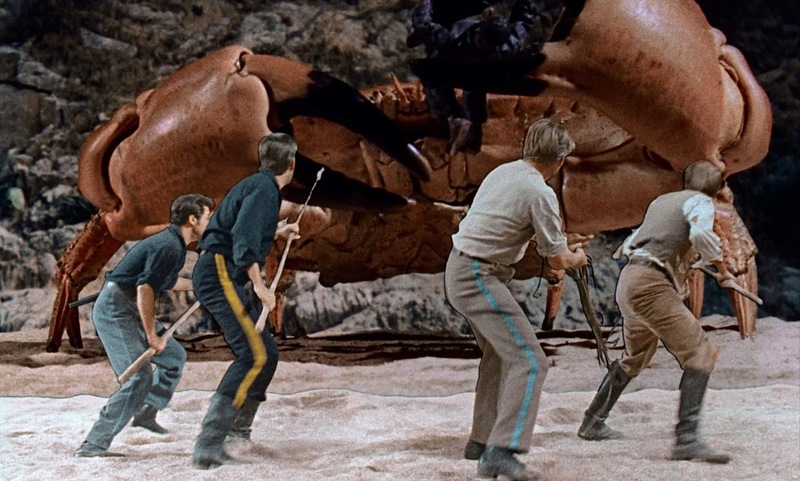 Jules Verne’s survivalist story also seems at odds with effects man Ray Harryhausen of The 7th Voyage of Sinbad (1958) fame who turns the exercise into a showcase for his stop-motion creations – giant crabs, bees, octopi and a giant chicken (Harryhausen insists it was meant to be a prehistoric Phoracos, although scenes where it gets served up as a giant chicken roast don’t exactly help). As always with Ray Harryhausen’s films, there seem problems in trying to root the creatures in the narrative. Certainly, Captain Nemo’s explanation about having created them in order to stop war is not at all convincing – the idea that war is caused by hunger is absurd. Nevertheless, the creature effects are fun, although the best special effects in the film oddly enough are not Ray Harryhausen’s but those during the balloon flight, which is a marvellously exciting sequence with the balloon being tossed about in the storm and the prisoners struggling through the surf as they are washed ashore on the balloon’s ring. The sequence is magnificently scored by Bernard Herrmann. Ray Harryhausen’s other films are:– the atomic dinosaur film The Beast from 20,000 Fathoms (1953); the giant atomic octopus film It Came from Beneath the Sea (1955); the alien invader film Earth Vs. The Flying Saucers (1956); the alien monster film 20 Million Miles to Earth (1957); the Arabian Nights adventure The 7th Voyage of Sinbad (1958); The 3 Worlds of Gulliver (1960); the Greek myth adventure Jason and the Argonauts (1963); the H.G. Wells adaptation The First Men in the Moon (1964); the caveman vs dinosaurs epic One Million Years B.C. (1966); the dinosaur film The Valley of Gwangi (1969); the two Sinbad sequels The Golden Voyage of Sinbad (1973) and Sinbad and the Eye of the Tiger (1977); and the Greek myth adventure Clash of the Titans (1981). Director Cy Endfield had made a couple of the Joe Palooka films and specialised in B-budget crime thrillers throughout the 1940s. Endfield had his greatest success with the colonial adventure film Zulu (1964). He made a couple of other entries of genre note withTarzan’s Savage Fury (1952) and the troubled Marquis de Sade biopic De Sade (1969).